Sometime in my teens Thanksgiving became my favorite holiday. There's a certain emotional warmth that comes with Thanksgiving. The warmth of being together with people who love and care about you. The warmth that comes with a day where you come together just to be thankful. It's quite restorative, for me at least. Thanksgiving is also special because it was my father's favorite holiday. He, too, loved that it was a low-key holiday where you were surrounded by loved ones. He passed away eight years ago, but he's always present in my mind on Thanksgiving Day. My mom started a new "tradition" a few years ago where everyone at the dinner table shares one thing for which they're thankful; it's one of the highlights of the day for me. This year I'm thankful for my middle sister. She's had a rough year, but the way she's dealt with it all has been inspirational, especially the last few months. The recipe below is another family tradition as my mom always made it for Thanksgiving breakfast. It was originally a Bisquick recipe, but a few years ago I didn't have any Bisquick but wanted coffee cake, so I engineered it into this version. Last year I substituted Living Without's Self-Rising Flour Blend for the all-purpose flour and it tasted exactly like it was supposed to! Preheat oven to 375°F. Grease and flour 8”x8” pan. Whisk flour, baking powder, and sugar. Blend in egg and milk. Mix brown sugar, walnuts and cinnamon; sprinkle over batter. Spoon cranberry sauce over top. Bake for 25 to 30 minutes. Drizzle glaze over cake and serve warm. This recipe was shared on Diet, Dessert, and Dog's Wellness Weekend and Gluten Free Fridays. I'll be bringing two pies for Thanksgiving Day, pumpkin and pecan. Both will be GF, per the method in my previous post. If you have difficulty finding the crust recipe, I've pinned it to my "Food - Dessert" Pinterest board. Unfortunately, my nutritionist recommended this past week that I try grain free (except quinoa) for a few months, so I won't be eating much of the traditional fare, including pie. There are very few women where I work as the construction industry is still a male-dominated field. We currently have two female engineers, and three women in the "front office" (admin, marketing, etc.) out of 22 employees. I was the lone female engineer for many years until recently. Because there were so few women, we used to have "ladies' luncheons". For a while we did it once a month, and then it tapered off to just a few times a year. The person who spearheaded them, we'll call her AD, has left for new endeavors so I don't know if we'll have any more. We would always pick a theme and everyone would bring in a portion of the meal. When I went gluten and cow free every item conformed to my new eating plan (not a diet) and that was pretty awesome. We had a woman who was vegan for a while, so we did vegan luncheons a few times. AD's mom is Vietnamese and so she grew up eating, and making, Vietnamese food. 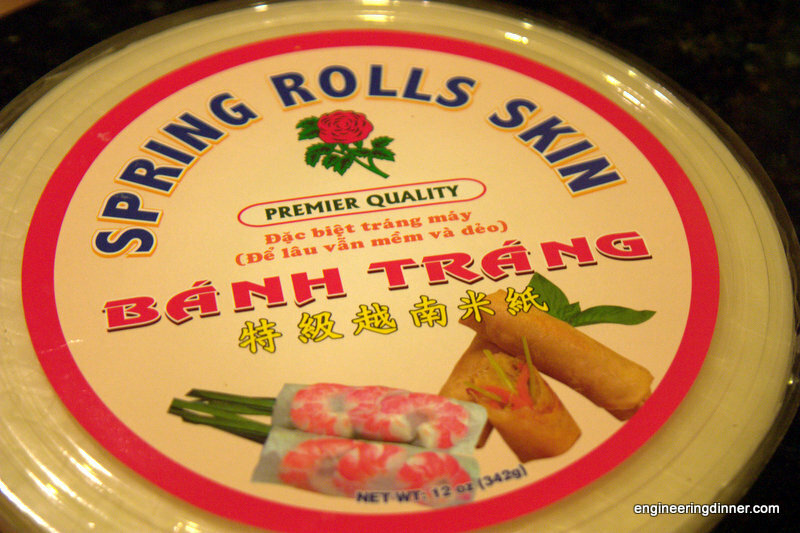 I had bought a package of spring roll wrappers, which I knew AD knew how to use, so we decided on spring rolls for the last ladies' luncheon we had. 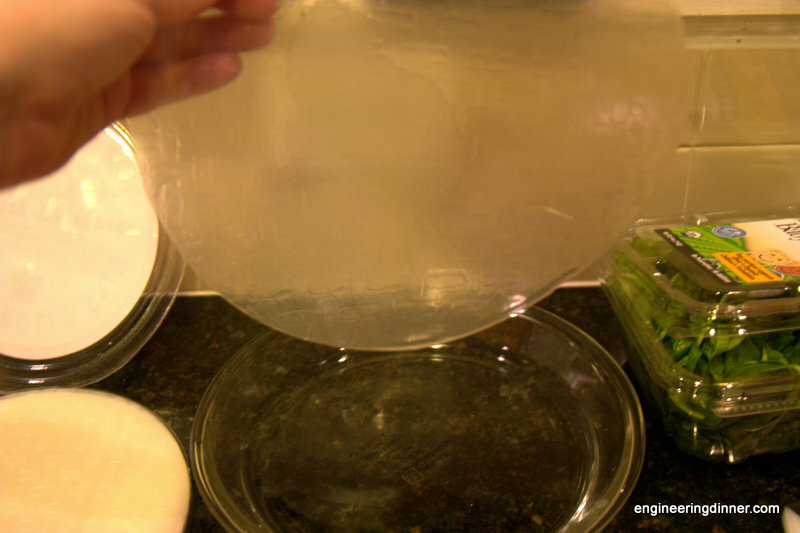 AD showed us the ropes for re-hydrating the wraps and filling and rolling them. 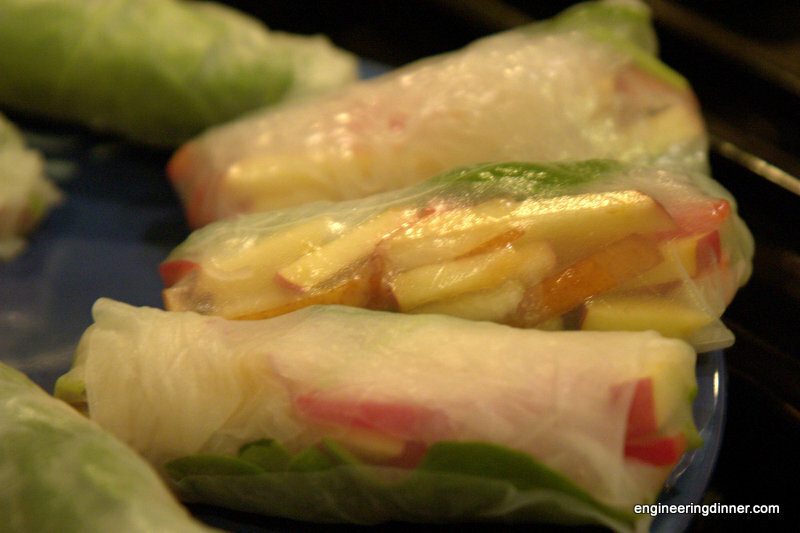 I enjoyed the spring rolls so much that I make them at home quite often. 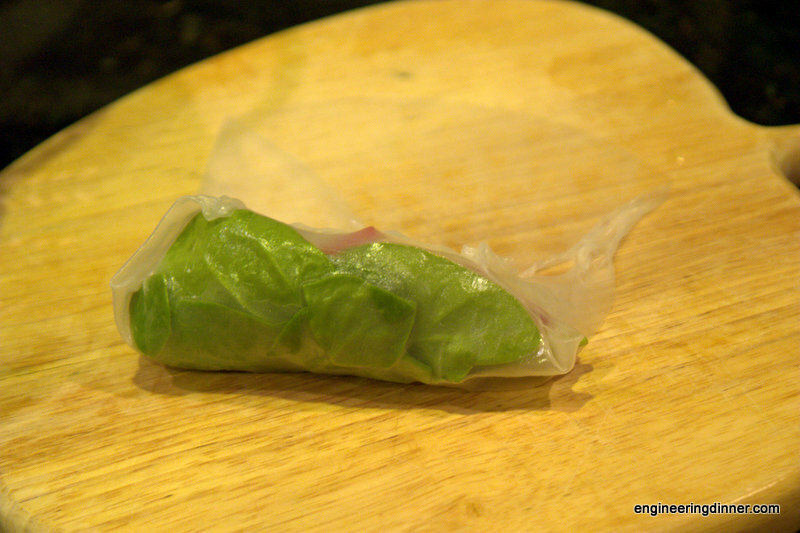 I do not make authentic spring rolls, but rather, something I call a "salad spring roll" which is basically whatever I have around, wrapped up. It's far more fun than plain salads! dipping sauce (optional) - I use this one, although salad dressing would also work! 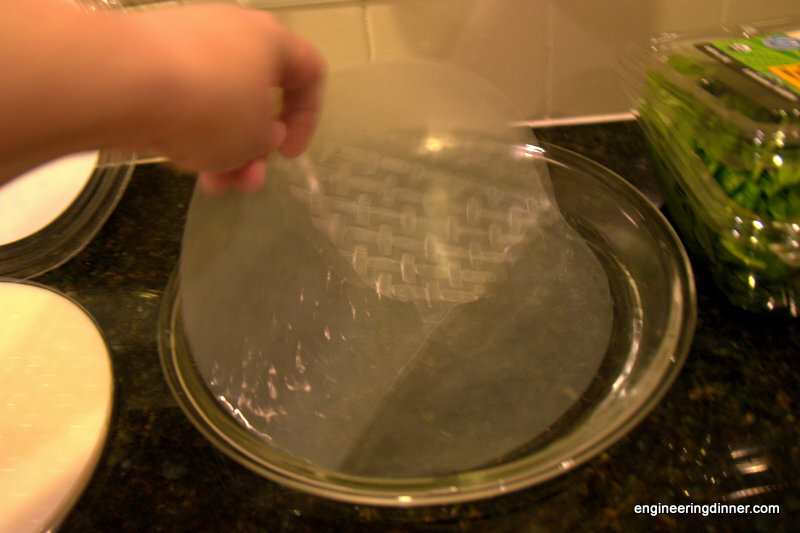 Dip the wrapper in the water so that it is wet. 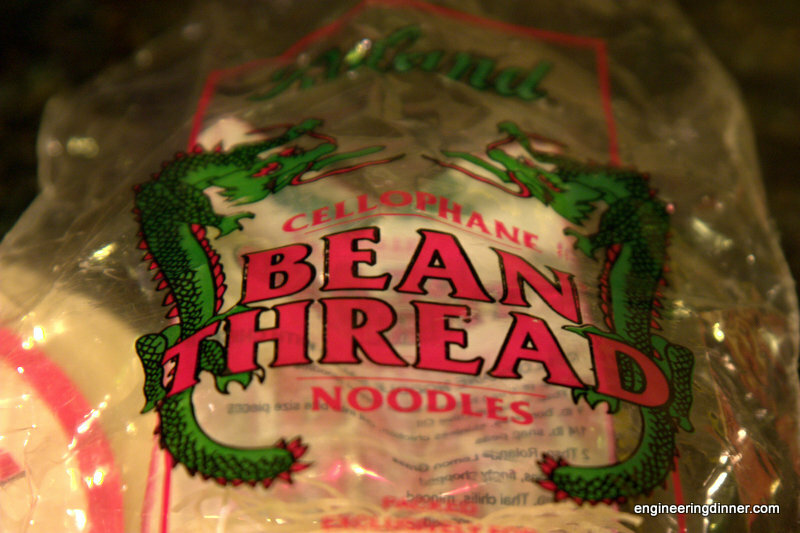 You don't want to put it in the water and saturate it. 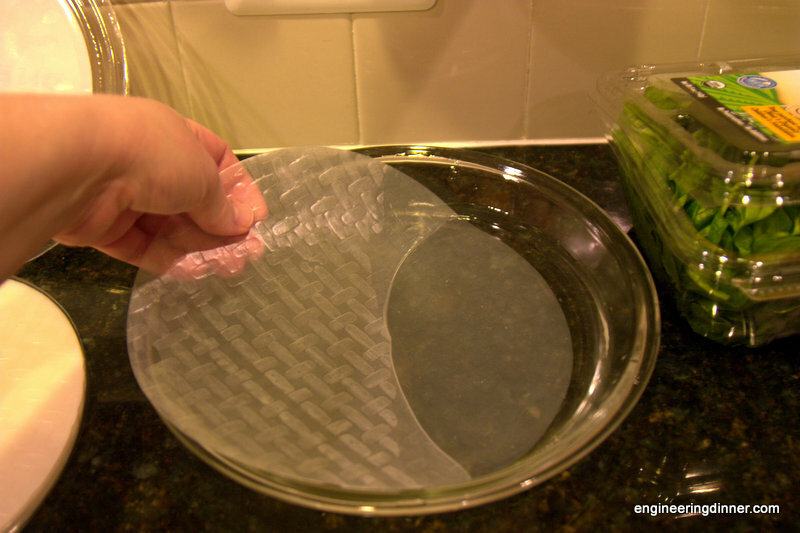 Let the excess water drip off and move it to your work surface. I like to use a wood cutting board. The wrapper will still be stiff, but will soften over the next minute. Once the wrapper starts to become pliable, pile the filling near one edge. By the time you've put your filling in, the wrapper should be completely pliable. Roll the edge over the filling. 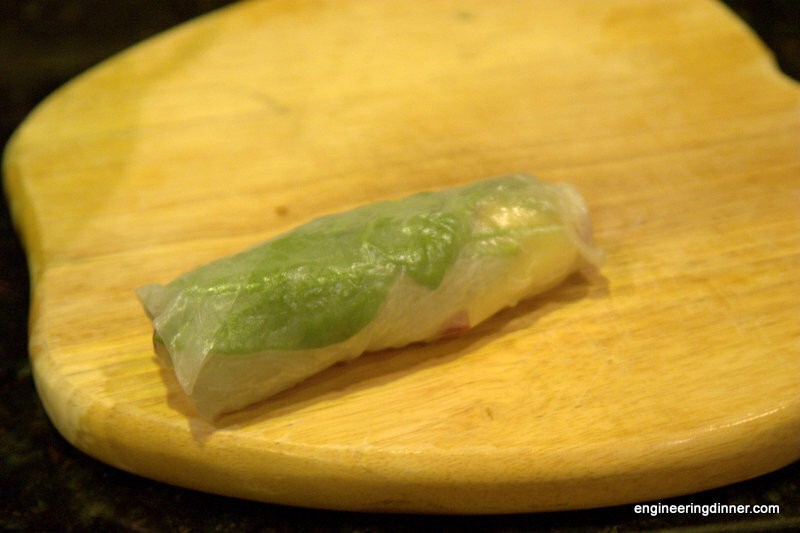 Then fold in the sides and continue to roll. The filling for the spring rolls in these photos is spinach, pear, apple, red pepper, and bean threads. This recipe was shared on Diet, Dessert, and Dog's Wellness Weekend, Gluten Free Fridays, Allergy Free Alaska's Whole Food Fridays, and The Daily Dietribe's 5-Ingredient Mondays. I'm watching Iron Chef and the challenge is leftover Thanksgiving. I just realized that this holiday is only two weeks away. Last year was my first time cooking Thanksgiving and I did a pretty good job. It was also my first gluten and dairy free Thanksgiving. In my family, the only gluten containing items are the gravy, stuffing, and pies. I used a GF all purpose flour in the gravy. I made a small portion of stuffing for myself and it was delicious! My mom has always made her stuffing from leftover pieces of bread that she saves throughout the year, so that's what I did as well, it just happens to be all GF bread. For the pecan pie (my favorite), I used my standard pie crust recipe with the high-protein flour mix from Living Without and Earth Balance. Since then I've realized that the pie crust method from Cook's Illustrated makes an awesome GF crust with that same high-protein flour mix. I used Healthy Top but will likely try the coconut cream this time around. This year we will be with my in-law's. I haven't coordinated yet, but I'm thinking everything will work approximately the same as last year. I have a late appointment on Wednesday, so leftovers will be easiest. My husband will be spending the weekend at Penn State for his annual boys weekend with his college roommates. I haven't decided what to do for the weekend, so I'll leave Saturday unplanned for now. What a week it's been! Not many things have gone according to plan, including my bed time. I cannot wait for the weekend. My husband did the grocery shopping a few weeks ago. The list said to buy 3-4 beets, and he did. But one of the beets was the largest beet I have ever seen! It was the size of 3-4 beets. (Unfortunately, I forgot to take a picture.) 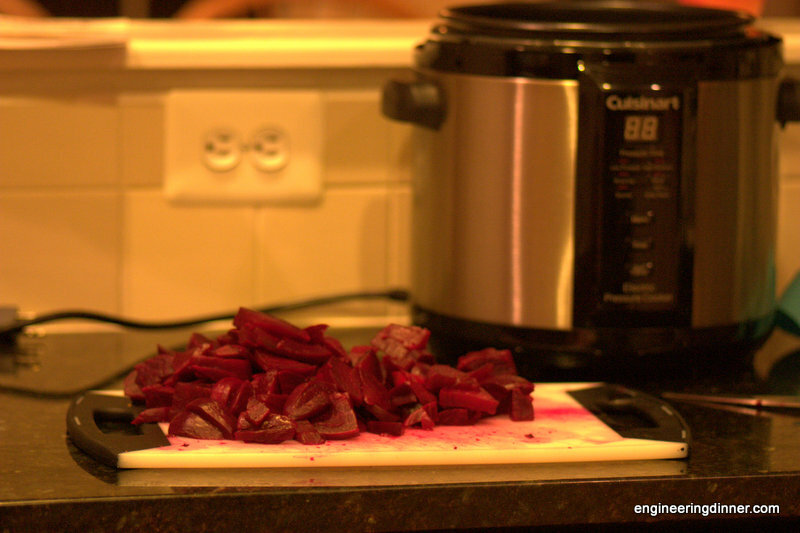 Knowing that we would not eat that many beets before they went soft, I went ahead and cooked them all and tried freezing them. 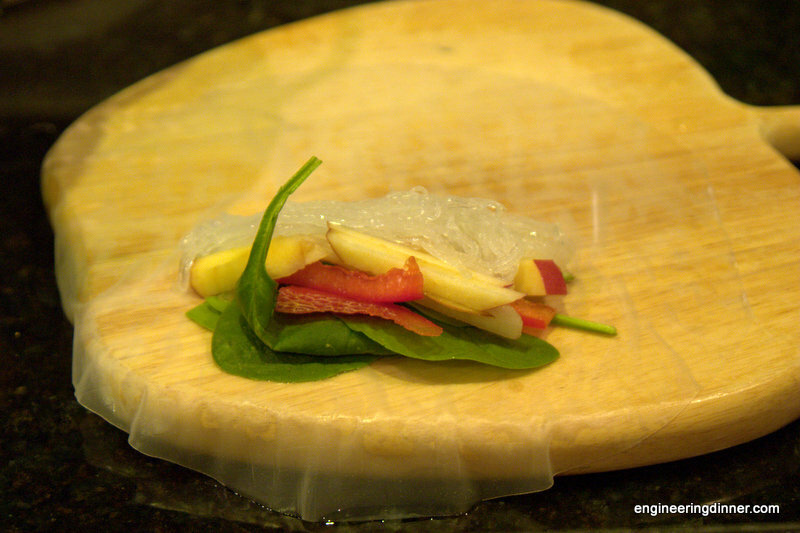 Much to my surprise, they defrost beautifully, which speeds up making this salad! 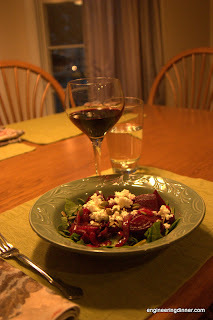 As an aside, my 2.5 year old son LOVES beet salad. He does not want a salad unless it has beets in it. Saute onion in olive oil over medium heat. I use a little more oil than I normally would as this becomes the dressing. Once the onions are sauteed, add in the beets, tomato, balsamic vinegar, and salt and pepper. Cook on low until everything is warm, usually about 5 minutes. Serve beet mixture over spinach. Top with fresh herbs, goat cheese, and pumpkin seeds. This recipe was shared on Diet, Dessert, and Dog's Wellness Weekend, Gluten Free Fridays, and Allergy Free Alaska's Whole Food Fridays. As I've mentioned before, I'm a Girl Scout leader. I have a troop of eight high school girls (seven 11th graders and one 10th grader.) I have two co-leaders, and none of us have girls in the troop. In fact, we're all in our early 30s, and two of us have young boys. I had a wonderful weekend with my Girl Scout troop. My co-leader's mom has a house at Lake Anna, VA and she graciously let us stay there for a fun overnight! Mainly the girls got a chance to be girls. They talked, fished, drove the golf cart, made fires, ate s'mores, and talked some more. We did work on our Sow What Journey, which explores food and the environment. We discussed making a hotbox to sow seeds in and then growing them in window gardens. We also had a "Chopped Challenge" which was basically like a team version of the show Chopped. I was blown away by their creativity and cooking skills. I have lots of notes and pictures, so I'll be blogging on that in the future, even though it wasn't gluten and diary free. What's up this week, folks? ELECTION DAY (at least in the US)! That's right, I'm excited to exercise my responsibility to vote. I don't care who you vote for, I just hope you vote. Some people consider it a right, but I think it's my responsibility as a citizen. I will be voting after work, so we'll be eating leftovers that night. Hurricane Sandy has come and gone. We were spared most of it in Northern Virginia, just a lot of rain and wind. We were fortunate enough to not lose our power, nor did we have any water in our basement. Our thoughts are with those who have not fared as well. We spent two days inside the house, which was challenging at times with a 2.5 year old who loves to play outside. We made these bars, practiced trick-or-treating, built lots of Mega Blok tunnels, read books, ran trucks around the house, and watched Fireman Sam. It was rather odd to wait out a hurricane at the end of October. I associate Fall with a lot of things, but hurricanes are not one of them. Fall is for leaves, raking, Halloween, apple cider, and, of course, squash. I promise to someday post about something other squash... but not today. Today I'm sharing my favorite tool for cleaning the seeds out of squash, or degunking, as I like to call it. That's right folks, the lowly grapefruit spoon is a squash-lovers best friend. Otherwise relegated to one task during the winter months, the shape is perfect and the serrated edge helps to cut away the strands. It also works well for cleaning seeds out of melons, such as cantaloupe. Best of all, the price is right!